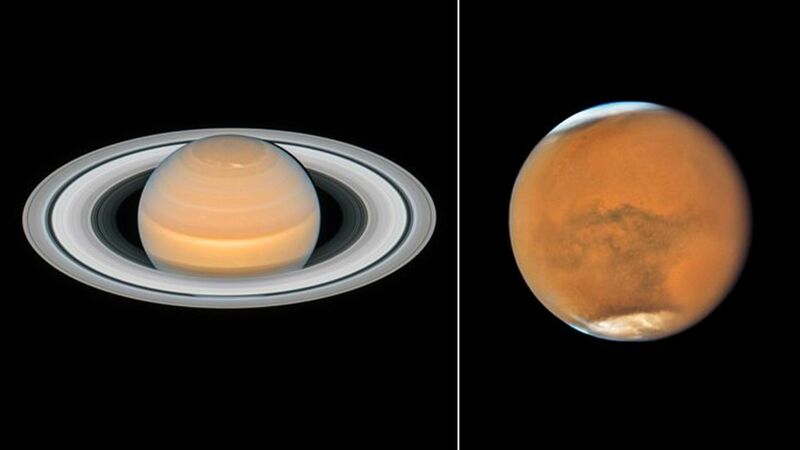 The NASA/ESA Hubble Space Telescope has captured new photos of Saturn and Mars, taken shortly before each was at its closest point to Earth, referred to as being in opposition. This occurs when the Sun, Earth and an outer planet are lined up, with Earth directly in between the two. The outer planet is fully lit up by the Sun as seen from Earth, according to the ESA. The details: Opposition allows astronomers to notice details on the planet's surface more clearly. The image of Saturn shows its ring system tilted towards Earth, which put its rings and the gaps between them on full display — the rings stretch out eight times the radius of the planet. Saturn was in opposition to Earth on June 27, and Mars will be on July 27, the ESA said. Hubble's image of Mars shows a "gigantic sandstorm enshrouding the entire planet," as well as the planet's white polar ice caps. These images allow astronomers to examine "how cloud patterns and large-scale structures on other planets in our Solar System change over time," the ESA said.